Latest satelliite images show that Neki is gaining strength as a burst of deep convection is now being displayed. Radar has a few rain bands staying south of the Hawaiian Islands. A few bands may cross the western Islands especially as Neki moves slightly closer later today. Interests in Johnston Isand should follow the progress of Neki closely. 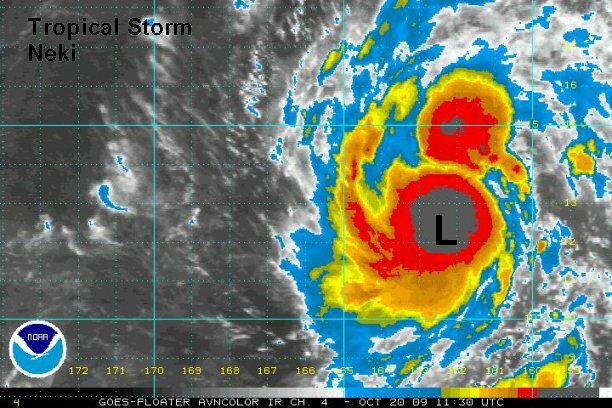 As of 8:00 am edt / 3:00 am pdt Neki was centered near 12.3° N / 162.3° W or about 685 miles south southwest of Honolulu. Top sustained winds are estimated at 50 mph (CPHC 40 mph). Neki is moving northwest about 17 mph. 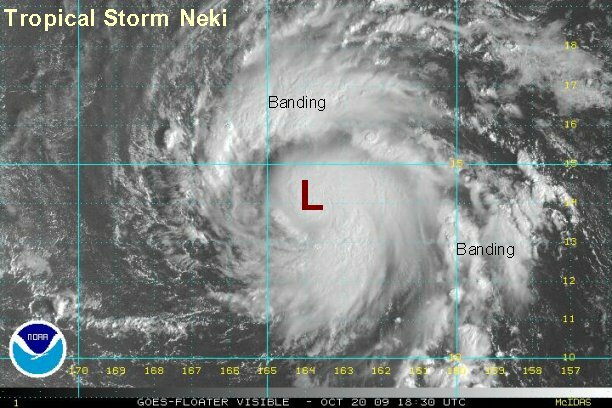 Nekii has organized quickly today displaying banding and a core of deep convection near the circulation center. Interests on Johnston Island should monitor Neki closely. As of 4:00 pm edt / 1:00 pm pdt / 11:00 am hst Neki was centered near 14.2° N / 164.0° W or about 635 miles south southwest of Honolulu. Top sustained winds are estimated at 65 mph (CPHC 65 mph). Neki is moving northwest about 18 mph. Neki has methodically strengthened over the past few hours and an eye feature is just becoming visible. We agree with CPHC's assesment of strength and forecast. Neki is in a zone of weak vertical wind shear the next few days so continued strengthening is forecast. It is moving northwest in a weakness in the subtropical ridge. This will continue to pull it away from Hawaii. As of 11:00 pm edt / 8:00 pm pdt / 6:00 pm hst Neki was centered near 15.5° N / 165.2° W or about 625 miles southwest of Honolulu / 295 east southeast of Johnston Island. Top sustained winds are estimated at 75 mph (CPHC 75 mph). 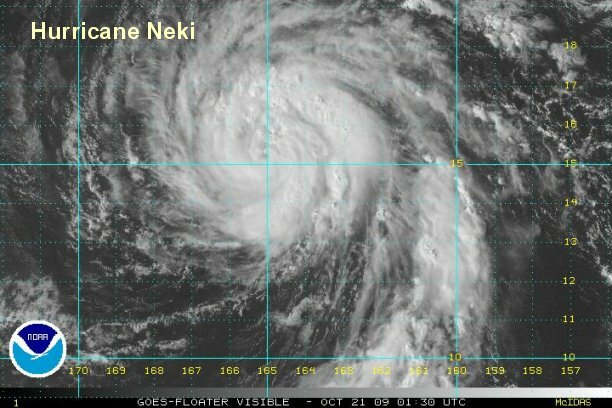 Neki is moving northwest about 15 mph. This will be our last update on Neki as it is not a concern to the main islands of Hawaii.